PostgreSQL or Postgres is an open source object-relational database management system (ORDBMS) with more than 15 years of active development. It's a powerful database server and can handle high workloads. PostgreSQL can be used on Linux, Unix, BSD, and Windows servers. PostgreSQL provides several ways to replicate a database. It can be used for backup purposes and to provide a high availability database server. In this tutorial, we will show you how to install and configure PostgreSQL 9.6 Master-Slave Replication on Ubuntu 16.04 server. We will use Hot standby mode, and it's a very good starting point to learn PostgreSQL in depth. Copy PostgreSQL Data from MASTER to SLAVE. In this tutorial, we will install the latest version of PostgreSQL 9.6. In the official Ubuntu repository, they provide PostgreSQL 9.5 only, so we need to install the latest version from the PostgreSQL repository directly. Add the postgreSQL 9.6 repository to the sources.list.d directory. And import the PostgreSQL signing key to the system. Now update the system repository with apt command. Next, install the PosgreSQL 9.6 package with the apt command below. If the installation has been completed, add it to start automatically at boot time. By default, PostgreSQL is running on the localhost (127.0.0.1) IP address with port 5432 on Ubuntu, check it with netstat command. PostgreSQL 9.6 is running on the system. In the next step, we have to configure a password for the postgres user. From the root account, log in to the postgres user with the su command, then access the postgres front-end terminal psql. Please change the password for the postgres user and check the connection info with postgres queries below. PostgreSQL 9.6 has been installed on the system, is running without error and the password for postgres user has been updated. UFW or Uncomplicated Firewall is an application to manage the iptables based firewall on Ubuntu. UFW is the default firewall configuration tool for Ubuntu Linux and provides a user-friendly way to configure the firewall. We can install ufw from the main Ubuntu repository with the apt command. 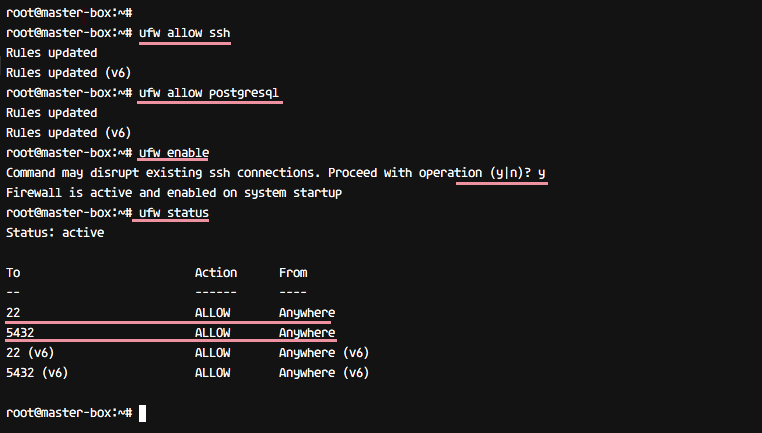 Add new services to the UFW firewall: add SSH and PostgreSQL services with commands below. Enable the UFW firewall and check the status. UFW firewall has been installed and the PostgreSQL service has been added. Run step 1 and step 2 on the MASTER and SLAVE server. The master server has the IP address 10.0.15.10, and the postgres service will run under that IP with default port. The master server will have permission for the READ and WRITE to the database, and perform streaming replication to the slave server. Go to the postgres configuration directory '/etc/postgresql/9.6/main' and edit the postgresql.conf file with vim. Uncomment 'listen_addresses' line and change the value to the master server IP address '10.0.15.10'. Uncomment 'wal_level' line and change value to the 'hot_standby'. For the synchronization level, we will use local sync. Uncomment and change value line as below. Enable archiving mode and change the archive_command option to the command 'cp %p /var/lib/postgresql/9.6/main/archive/%f'. For the 'Replication' settings, in this tutorial we use 2 servers only, master and slave, uncomment the 'wal_sender' line and change value to 2, and for the 'wal_keep_segments' value is 10. For the application name, uncomment 'synchronous_standby_names' line and change the value to the name 'pgslave001'. In the postgresql.conf file, the archive mode is enabled, so we need to create a new directory for the archive. Create a new archive directory, change the permission and change the owner to the postgres user. Next, edit pg_hba.conf file for authentication configuration. Paste configuration below to the end of the line. Save and exit, then restart PostgreSQL. PostgreSQL is running under the IP address 10.0.15.10, check it with netstat command. Next, create a new user for replication. We will create a new user named 'replica' with password '[email protected]'. Please choose a secure password here for your setup! Log in to the postgres user and access the postgres front-end terminal psql. Create new 'replica' user with password '[email protected]' with postgres query below. Now check the new user with 'du' query below, and you will see the replica user with replication privileges. MASTER server configuration has been completed. The SLAVE server has IP address 10.0.15.11. And this server will only have a READ permission to the database. The Postgres database server will run under the IP address of the server, not a localhost IP. Stop the postgres service on the slave server with the systemctl command below. Go to the Postgres configuration directory '/etc/postgresql/9.6/main', then edit the configuration file 'postgresql.conf'. Uncomment the listen_addresses line and replace the value with the slave server IP address 10.0.15.11. Uncomment 'wal_level' line and change the value to the 'hot_standby'. For the synchronization level, uncomment the synchronous_commit line and change the value as shown below. For the replication setting, uncomment the max_wal_senders line and replace the value with '2' because just use 2 servers. And for the wal_keep_segments, change the value to '10'. Uncomment the 'synchronous_standby_names' line for the application name and change value to the name 'pgslave001'. Enable hot_standby for the slave server by uncommenting the following line and change value to 'on'. Next, we want to replace the postgres main directory on the 'SLAVE' server with the main data directory from 'MASTER' server. Log in to the SLAVE server and access postgres user. Go to the postgres data directory 'main' and backup it by renaming the directory name. Create new 'main' directory as 'postgres' user and make sure have a permission like the main-bekup directory. Next, copy the main directory from the MASTER server to the SLAVE server with pg_basebackup command, we will use replica user to perform this data copy. When the data transfer is complete, go to the main data directory and create a new recovery.conf file. Save and exit, then change the permissions of the file to 600 with chmod. Now start PostgreSQL 9.6 on the SLAVE server and make sure the postgres service is running on IP address 10.0.15.11 with netstat. Data transfer and configuration for the SLAVE server has been completed. For testing, we will check the replication status of the PostgreSQL 9.6 and try to create a new table on the MASTER server, then check the replication by checking all data from the SLAVE server. Log in to the MASTER server and log in to the postgres user. 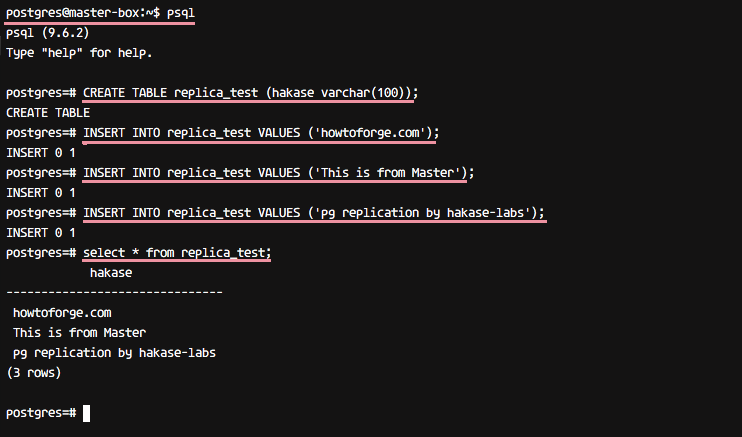 Run psql commands below to see the replication status. 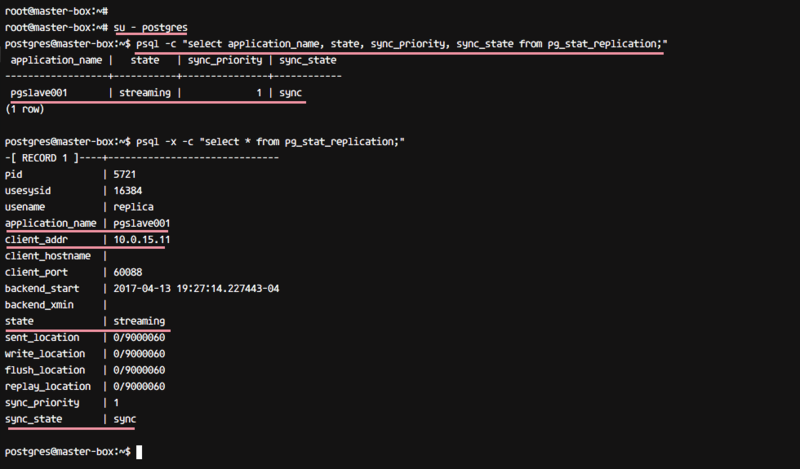 psql -c "select application_name, state, sync_priority, sync_state from pg_stat_replication;"
You will get the results as below. Next, try to create a new table from the MASTER server. Log in to the postgres user on the master server. 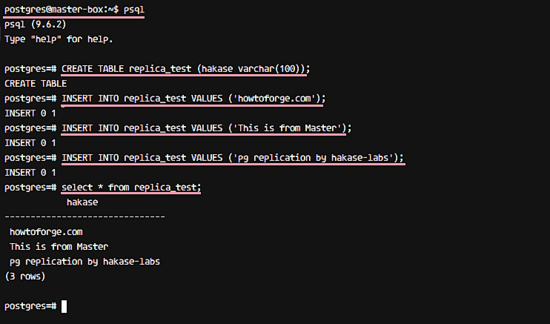 And create a new table named 'replica_test' and insert data to the table by running postgres queries below. Next, login to the postgres user on the SLAVE server and access the psql terminal. Check data on the 'replica_test' table with postgres query below. And you will get same data as on the MASTER, it's replicated from the MASTER server to the SLAVE server. Test to write on the SLAVE server with the query below. And you will get an error message about 'Cannot execute INSERT' query on the SLAVE server. Installation and Configuration of the PostgreSQL 9.6 with Master-Slave Replication on Ubuntu 16.04 Xenial Xerus has been successful. I have to disagree with your statement.You should have only copied /var/lib/postgresql/9.6/main into /var/lib/postgresql/9.6/main-bekup.The config-files had nothing to do with that. Tengo un problema cuando reinicio los servidores, se pierde la la conexion, se borran los datos que se encuetran en la tabla pg_stat_replication. Why you set max_wal_senders to '2' if you have one slave? there should be : max_wal_sender = 1And also setting on slave those parameters? So why are setting this on slave? This is so far I found online was good enough to setup Postgresql 9.6 master/slave in ubuntu14/16, even it is for ubuntu16 instruction, but not much different from 14 in my view. here are my comments to setup correctly.